Haniyyah Barnes was sentenced to four years in prison after being convicted of throwing her neighbor’s dog into oncoming traffic during an argument. A New Jersey woman was sentenced to four years in prison Wednesday for throwing her neighbor's small dog into ongoing traffic during an argument over a parking space, the Associated Press reports. Haniyyah Barnes, 29, also has to pay the neighbor $2,000 in restitution and perform 30 days of community service with an organization dedicated to preventing animal cruelty, AP notes. 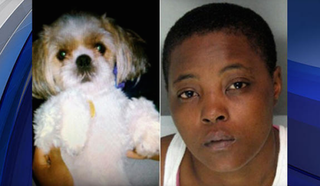 Barnes was convicted last October of animal cruelty, theft and criminal mischief in the August 2011 death of the 2-year-old Shih Tzu, named Honey Bey. According to the report, jurors could not reach a verdict on a burglary charge, but prosecutors plan to retry her. Barnes is accused of kicking in the front door of the neighbor's home, grabbing the barking dog and throwing the animal into oncoming traffic, where she was hit by a vehicle and killed. An officer who was sitting in a patrol car saw the incident unfold and arrested Barnes right away.